Val Doonican's chart career began as the Beatles and the Rolling Stones were reaching their peaks- proving, despite the nonsense claimed in some books about the music of the 1960s, that there was room in the music of the day for everything. Val had started his musical career in Ireland being an accomplished player of the banjo, guitar and mandolin. His personality, as well as his music, helped him soon become established when he made the move to England during the early 1950s. His big break came in 1963 from an appearance on ITV's 'Sunday Night At The London Palladium', following which he got his own TV series. His relaxed, good humoured, gentle style made him extremely popular with British audiences. His TV shows were evidence that Val owed a lot to American performer Perry Como- complete with knitted sweaters and rocking chairs. Although Val had many novelty songs- usually based on his own brand of Irish humour- 'Delaney's Donkey', 'O'Rafferty's Motor Car' etc, it was his gentle ballads that usually gained greatest chart success. These numbers became a staple part of his TV show which in turn became an accepted part of British life just as much as the 'Morecambe & Wise Show'. Val Doonican's enviable chart career came to an end during the 1970s but the TV show continued, retaining its popularity, until Val decided to take a less active show business life. 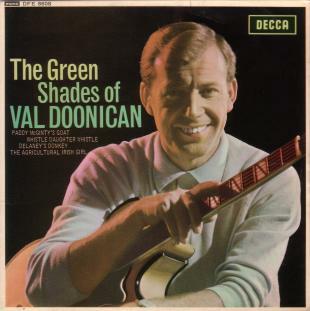 The EP on the left "The Green Shades Of Val Doonican" (DFE8608) was a huge seller throughout 1965 and carried material that was all Irish in origin. The record's sleeve notes tell of Val's start as a professional in Ireland as part of a rhythm quartet playing for a hotel audience. This eventually led to his own show on Radio Eireann and thence his move to London in 1953. Decca DFE8587 1964 "Val Doonican"
Pye NEP24295 1968 "Mixed Bag Of Doonican"